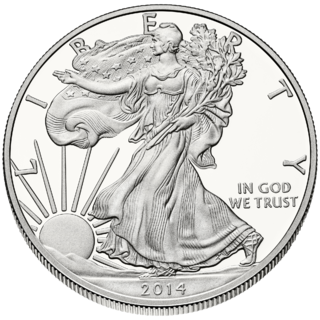 The main article for this category is Bullion coin. Pages in category "Bullion coins"
Palladium coins are a form of coinage made out of the rare silver-white transition metal palladium. Palladium is assigned the code XPD by ISO 4217. The first palladium coins were produced in 1966. Palladium as an investment is much like investments in other precious metals. Platinum as an investment has a much shorter history in the financial sector than gold or silver, which were known to ancient civilizations. Experts posit that platinum is about 15–20 times scarcer than gold, on the basis of annual mine production. Since 2014, platinum rates have fallen significantly lower than gold rates. More than 75% of global platinum is mined in South Africa.